Zara is in veil. Irfan distracts Kabir so Zara goes in. Kashan is worried about Samir. Samir gets ready as groom and says when drama is done then I will take Alina away. Salamat says we need to achieve our objective then you can get the girl. Samir thinks no I will marry Alina. Kabir thanks Irfan for coming. Irfan says Alina is like my daughter, it would be wrong if I didnt come. Amir comes to Zara and asks if she found some proof against Zeenat? Zara says no, we have to do something fast. Zara goes in Zeenat’s room and says why would she do all this? I have to find something. Alina comes in function dressed as bride. Ayesha gets emotional and kisses her forehead. Alina prays for everything to become right. Irfan sits down to read nikah and thinks where is Zara? He asks for water. Kabir hints to Zeenat, she nods and leaves. Kabir gives water to Irfan. Zeenat says to Kashan that go outside and see people are here. Kabir says me and Asad will be witnesses. Zara hears Zeenat’s phone ringing and sees its Samir’s call. He says baraat is coming? We are coming there, guests are going to come and then drama will start, Kabir and Irfan will remember it for life. Zara is stunned and ends call. Irfan asks Alina if she accepts nikah? Ayesha asks her to say yes. Zeenat thinks say yes, guests are coming. Zara comes there and says no.. All look on. Alina smiles. Zara says we cant force Alina for marriage. Zeenat says what are you doing here? Zara slaps her hard, all look on. She grabs Zeenat’s hand. Kabir pulls Zara back from here. Zara glares at her. Ayesha asks what she is doing? Zara says to family that Zeenat invited whole city here to insult Kabir and Irfan, what if they see that its not Alina and Amir but Anas marrying her, then they will know that nikah papers were fake and then my husband and father will have to leave sharia board. Ayesha says what if this is a lie? Zara says Salamat and Samir are waiting outside to do all that, all guests will come, we dont have time, I am doing all this for this house. She holds Kabir’s hand and says God is telling that Amir and Alina are made for each other, she has right to choose. Kabir says we are saving our tradition, its a sin. Zara says she is asking to marry, its not wrong, girl has to accept her marriage, she has right to say yes to her choice, Islam doesnt allow us to force girls. Kabir says girls accept their parents’ choice because of respect, Amir will never marry Alina. PRECAP- Kabir says to Zara that I am not changing my words, Anas will marry Alina only, I dont care about respect. Salamat and Samir bring guests there. 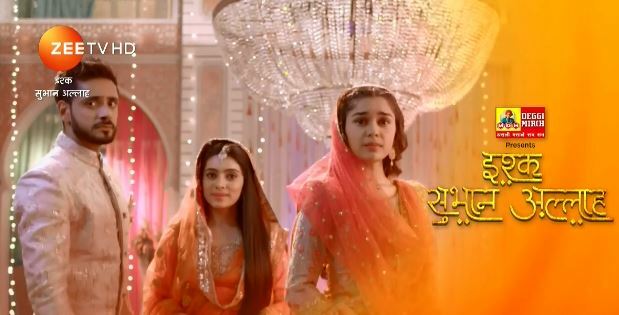 The post Ishq Subhan Allah 28th February 2019 Written Episode Update: Zara tries to stop wedding appeared first on Telly Updates.